Spearmint essential oil is similar to peppermint essential oil. It has a pleasant minty aroma and refreshing characteristics like peppermint, and it is often substituted for it in aromatherapy as peppermint can be too strong for some people, and it may even induce skin irritation or other unwanted side effects on sensitive skin. Spearmint, officially known as Mentha spicata, is a safer, milder alternative with far less menthol than peppermint, and it can be used for a wide range of medicinal purposes, from treating fatigue and headaches to oral health. While it hasn’t been researched quite as extensively, its use dates back thousands of years to ancient Greece and originated in the Mediterranean region. This perennial herb was often used, according to historical records, to heal mouth sores, treat sexual transmitted disease and whiten the teeth. Today, it’s found throughout North America, where it was used by some of the earliest immigrants way back in the 16th century. During those challenging times, pioneers utilized it to help prevent and treat scurvy because of its high vitamin C content. One of the reasons spearmint essential oil is so beneficial is that it contains powerful antimicrobial properties which have been demonstrated in studies, including a 2010 study published in the Journal of Essential Oil Research. These compounds are derived from chemical constituents known as carvone and cis-carveol, which have be found to be effective against multiple bacterial strains, including E.coli and Staphylococcus aureus, as well as a number of fungal pathogens. 2011 research published in the Journal of Microbiology Research focused on the effects of the oil on Candida albicans, Aspergillus niger and Bacillus subtilis, and found that it was most effective against E.coli, though it also demonstrated benefits as a preservative and antiseptic. In addition offering antibacterial, antiseptic and antimicrobial properties, spearmint essential oil is considered to be a decongestant, antispasmodic and a disinfectant, with an extensive array of uses, including the following. Spearmint has been used to relieve digestive woes for centuries. Today, it’s one of the most popular uses of spearmint essential oil thanks to its soothing and antispasmodic properties which are known to help treat bloating, stomach cramps, gas and indigestion. Research, including a 2012 Brazilian study, has confirmed that it’s effective for relieving cramping and spasms because of its carvone content. If you’re feeling nauseous, whether it’s from an illness, something you ate, pregnancy or something else, spearmint essential oil is one of the best natural remedies. A number of studies have focused on the anti-nausea benefits of the oil, with promising results – and those who use it for this purpose, swear by it. A 2013 study discovered that when two drops of spearmint essential oil were mixed with an equal amount of peppermint essential oil and administered orally in a capsule, patients undergoing chemotherapy treatment experienced a dramatic reduction in both nausea and vomiting. Other research conducted the same year out of Carolinas Medical Center University in Charlotte, North Carolina found that inhalation could be just as effective as a capsule. Their results showed that it significantly reduced nausea and vomiting in patients following surgery. Spearmint essential oil can treat common respiratory problems as well, including colds, nasal congestion, asthma and the flu, thanks to its numerous chemical constituents, like menthol, which are well-known for treating their symptoms. When the oil is inhaled, it can clear up congestion in both the respiratory system and the sinuses. Plus, as it offers decongestant and anti-inflammatory properties, it’s pretty much guaranteed to help make breathing easier. One of the best ways to use it for this purpose is to add a few drops to a bath. Also similar to peppermint, spearmint is known to help relieve pain. It’s particularly beneficial for aching muscles and pain that’s associated with the menstrual cycle. Thanks to its ability to lower inflammation, it also relieves pain linked to inflammatory problems. In fact, research out of Hangzhou, China’s College of Medicine at Zhejiang University in 2008 showed that spearmint essential oil was able to improve inflammation in patients with chronic obstructive pulmonary disease (COPD). According to WebMD, spearmint essential oil can be applied directly to the skin when mixed with a carrier oil to relieve swelling inside the mouth, nerve pain, arthritis symptoms, muscle soreness, and skin conditions like urticaria and pruritus. For sore muscles, it’s suggested to combine 20 drops of spearmint essential oil to about a half cup of water in a spray bottle and spray it directly onto the affected areas. Don’t rub it in, simply allow it to dry. For other types a pain, mix together a massage oil using 50 drops of spearmint essential oil and 3 ounce of a carrier oil like almond oil, coconut oil or grapeseed oil. You can also add a few drops to a bath and soak in it for 20 minutes or so for relief. There’s a reason why spearmint, along with peppermint, is often found in products designed to support oral health, such as mouthwash and toothpastes. It not only provides a refreshing minty taste and aroma, but it makes products more effective due to its outstanding antiseptic and antibacterial qualities. It helps to eliminate germs as well as encourage any wounds to heal faster, while also soothing soft tissues like the gums. You can add a few drops to your a natural DIY toothpaste, or any toothpaste, to protect against bacteria, fight infection and keep your breath smelling minty fresh. If you haven’t tried making your own natural toothpaste, you might want to use this recipe that includes spearmint essential oil – it’s easy, affordable and effective. To put together a batch, you just need some baking soda, coconut oil, and, of course, spearmint essential oil. Combine 3 parts baking soda to 1 part coconut oil – you want it to be nice and creamy. Then, add 5 drops of spearmint essential oil. Use your best judgment, you may want to use less or more of any of the ingredients depending on your personal preference. Once you’ve mixed up your paste, simply apply it to your toothbrush as you would any other toothpaste. It’s great for naturally brightening the teeth as well as fighting off bacteria. The scent of spearmint can help revitalize you when you are feeling tired, stressed, or nervous. It has also been said to promote feelings of courage and confidence, which means when you’re feeling down or anxious, inhaling a little spearmint essential oil can make you feel better, and even boost your mood. Spearmint can provide relief from neck tension that can come as a result of fatigue and stress as well. Spearmint essential oil is also known to be an effective natural remedy for problems like anxiety and mild depression. According to the World Health Organization, depression is one of the leading causes of disability worldwide, and the symptoms, that can include extreme fatigue, lower self-esteem, insomnia, hopelessness, changes in appetite and feelings of lethargy, can often be debilitating. Psychotherapy and antidepressants are the usual treatment modality for depression, but they typically come with a host of problematic side effects, like nausea, insomnia, constipation, nightmares, anxiety, drowsiness, restlessness, weight gain, and many others. People suffering from mild forms of depression may benefit from spearmint oil because of its energizing, uplifting properties. And, unlike pharmaceutical medicals, it doesn’t come with that long list of possible harmful side effects. For mild depression, try taking regular baths with a few drops of spearmint essential oil added in. For easing stress and improving concentration levels, try diffusing it in your home, office or both. Spearmint essential oil can be especially effective for improving both scalp and hair health. Thanks to its antifungal and antibacterial nature, it can treat scalp conditions like dandruff and even lice. Its cooling menthol content also makes it an excellent remedy for itching and dryness too. The oil fights the fungus that causes dandruff without drying out the scalp and eliminates problems that lead the scalp to flake. Many people suffer from an itchy scalp, even if they don’t have dandruff, and as that’s often caused by fungus or bacteria, it can relieve that too. To use spearmint essential oil to treat either condition, simply add it to your regular shampoo. Use about 10 drops per eight ounces of shampoo and just wash your hair as you normally would, but instead of rinsing right away, allow it to sit on the scalp for a few minutes so that it can soak up the benefits of the oil. Another option is to apply it as an overnight treatment. Fill up an empty, small bottle about three-quarters of the way with jojoba or sweet almond oil, and then add 15 drops of spearmint essential oil. Massage the solution into your scalp for a few minutes to ensure that it’s totally saturated. Put your hair up in a shower cap, or some other type of covering so that the oil doesn’t get onto your linens, and keep it on until morning. Then, just wash and conditioner your hair as normal. Due to its antifungal, anti-inflammatory and antibacterial properties, the oil is also effective for treating all sorts of skin problems, including psoriasis and acne. While tea tree oil is arguably the most common oil for treating acne, spearmint oil is great for those who can’t tolerate it as it tends to be more gentle. You can use it as a spot treatment to diminish both redness and swelling – use a very tiny amount combined with a solution of equal parts jojoba oil, vitamin E and 3 drops of peppermint oil to dab onto problematic areas. It’s a lot less drying than tea tree oil when you need to treat a larger area of your face prone to breakouts. Its powerful makeup makes spearmint great for addressing nail problems too. You can use it at full strength to treat toenail fungus or to keep your fingernails healthy and strong, combine a few drops of spearmint oil with 2 ounces of castor oil, which also offers antifungal properties. Dip each nail in the solution and allow it to absorb for several minutes before moving on to the next. The spearmint oil will offer a nice cooling effect as well as helping to seal in moisture. If you’ve got tired, dry feet, dilute some Epsom salt in warm water and add a few drops of spearmint oil for the ultimate spa foot treatment. Craving something that’s probably not the best for your body or your mind? Try inhaling spearmint essential oil. It can also help reduce hunger in between meals, and even help you feel fuller faster when you do sit down to eat. Diffuse it in the house, and when you’re out, you can simply apply a couple of drops mixed with a carrier oil to your chest or temples. Studies have shown that essential oils from various aromatic medicinal plants are highly active against some viral infections, including labial herpes caused by herpes simplex virus type 1. Oils like tea tree oil, peppermint oil and spearmint oil have demonstrated in vitro a significant antiherpetic activity. They are also highly active against acyclovir-resistant herpes simplex virus strains. Add a drop of spearmint essential oil, or a combination of spearmint, tea tree and peppermint oil with a carrier oil, to the affected area three to four times a day to relieve pain as well as to reduce the severity and length of an outbreak. A common belief is that because essential oils are natural, they are always safe to use. Unfortunately this isn’t always the case. When using essential oils for skin care, consider the following safety points. Always dilute an essential oil in a carrier oil before topical application. You can see a big list of carrier oils and what they are good for in our guide here. A 2% dilution is advisable. Do not apply essential oils on or near the eyes, lips or mucous membranes. 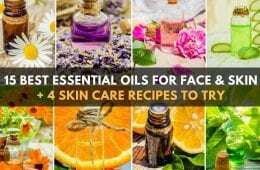 Avoid the use of essential oils on broken, irritated, damaged, or diseased skin. Some essential oils increase photosensitivity. Do not use these oils before going out in the sun. For a full list oh phototoxic essential oils, visit here. If pregnant or nursing, educate yourself on which oils you can use safely. If in doubt, don’t use an oil. This guide will help you safely use essential oils while pregnant. When buying essential oils it’s very important to choose a retailer that you trust and sells only 100%, quality, pure essential oils. We highly recommend Plant Therapy for their affordability and consistent quality. Head to their official website here where you can purchase a 10 ml bottle of pure spearmint essential oil.